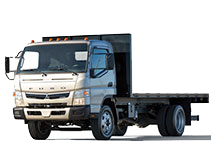 Our all-new FUSO cabover trucks redefine the business vehicle with enhanced engine durability and reliability, improved fuel economy, and up to 12,490 lbs. of payload capacity. Low emissions and exceptional fuel economy are achieved through innovative FUSO engineering, like an electronically controlled cooling fan. Our trucks also provide exceptional visibility and car-like maneuverability. Add to this a nationwide network of highly trained and dedicated dealers, as well as an industry-leading warranty that protects not only the engine, but the entire powertrain. FUSO trucks will change the way you think about keeping your business moving. Our ultra-efficient advanced engines are always at the ready with dependable performance and efficiency. You’ll enjoy the long haul in our most comfortable cab ever, fully equipped with an ergonomically designed interior, adjustable steering wheel, and spacious seating and stowage. For additional peace of mind, the optional Mobileye® collision avoidance system with audible and visual alerts can be added. A panoramic windshield and a driver-to-ground line of sight of only 6 ft. ensure you stay focused on the task ahead.